Hi there! Welcome to Mrs. Lincoln's Inkin'!! 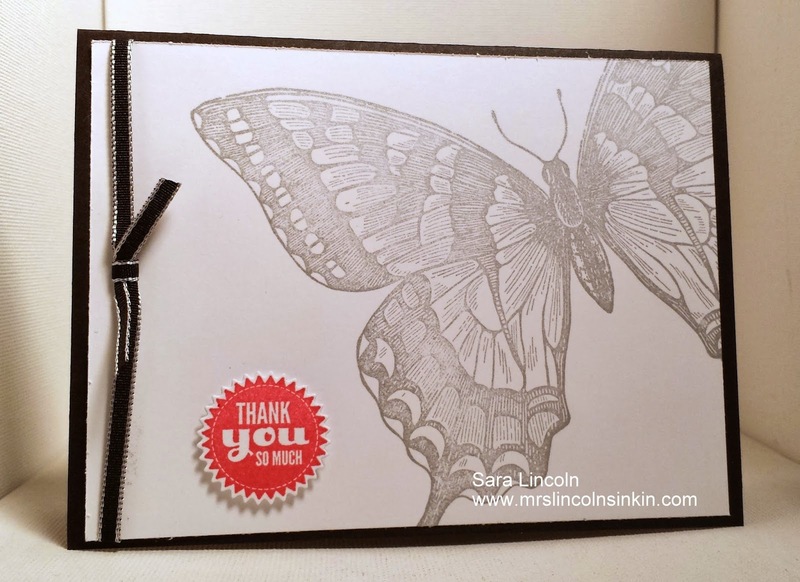 Quick post for you today showing you a Thank You card where i used the Silver Encore Ink and the Swallowtail stamp! I am loving the Silver Encore ink, it shimmers just ever so subtle. It also comes in Gold (which i haven't used yet but am eager to). I love cards that are mainly Black and White with just a pop of color somewhere, that is where my Strawberry Slush comes into play. I used my Starburst Framelits along with the Starburst Sayings and that is the only "color" that is on my card today. The item that i am showcasing today is the Swallowtail stamp. It is a large stamp and you can get it either wood mount or clear mount.